Lights are the most important components of security systems. Well-lit locations are generally avoided by trespassers, because such areas can disrupt stealthy movements. The isolated nature of far-flung locations, such as military bases, mining sites, agricultural operations and manufacturing plants, can be made secure with solar perimeter lighting, coupled with other security devices. Solar light towers that are used to enhance security systems in remote locations are equipped with surveillance accessories. For example, a small Internet Protocol (IP) camera with connectivity features can be attached on the light tower to monitor the area. Such accessories have low power requirements, and work with the panels on the tower for consistent power. During surveillance, operators can take control of the camera remotely, using an app or recording software. Because the operator does not need to be within close proximity to the security system during surveillance, the chances of unpredictable confrontations during break-ins are greatly reduced. When coupled with powerful luminaries, cameras are able to record activities in far distances. This combination applies to surveillance devices that record in color, day/night and monochrome. White light with color temperature ratings between 5,000-6,000 Kelvin (a mixture of 400-700 nm wavelengths) are required for clear imagery. Additionally, lighting angles must be properly set in order to boost the quality of the recording. A solar tower’s telescoping features allow operators to setup an optimal angle of illumination to cover the entire target area. Traditionally, the fixtures emit a fixed angle, ranging from 10 and 20 to 30 and 60 degrees. For camera recording, the fixed nature of the lights can be a problem. Lighting requirements may change, depending on the camera’s field of view and focus. Light angle settings are usually made during setup and installation, using the Inverse Square Law (“how the intensity of a light is inversely proportional to the square of the distance from the light source”) for maximum beam coverage. It is essential to consider that the Inverse Square Law is applicable to both white light and infrared camera settings. The practice may also be utilized to accurately calculate the number of solar light towers needed on the site when covering far distances. LEDs, with their instant toggle features, low energy requirements and reliable solid state design, are ideal luminaries for solar lighting applications. Additionally, the use of solar panels for harvesting energy can help decrease operational costs, and boost security efficiency because it does not produce noise (compared to gas-powered light towers). This could allow operators to position the lights closer to the active sections of the site, without distracting nearby workers. One of the main advantages of solar light towers is the reduction of operational and maintenance costs. An in-depth cost analysis shows the hidden costs of fuel-powered light towers. A unit with a capacity of 35 gallons (the common capacity for fuel-powered light towers), and a consumption rate of .65 gallons of diesel per hour, uses roughly 15.6 gallons per day. When factoring in $4 of diesel cost per hour, a fuel-powered tower costs around $62.40 to operate for 24 hours. In a year (including weekends and holidays), that figure could reach a whopping $22,776. There are also other factors to consider that could push operational estimates even higher. The first is fuel runs (the lifespan of the fuel type must be taken into consideration). Gasoline (E10) has an average shelf life of three months, while Ethanol-based alcohol fuel can last up to 90 days. This means that businesses that rely on gas-powered towers must make continuous trips to a fuel source to maintain power. Workers also need to be compensated for the maintenance of fuel levels, as well as repair jobs during malfunction (check fluid levels, change oils and filters, inspection of loose parts and etc.). Over a ten-year period, each fixture on the site could reach $250,000 with unforeseen costs increasing steadily, as the towers succumb to depreciation. Most companies deploy more than one light tower on the site, which can have a multiplying effect on the operational costs of fuel-powered fixtures. 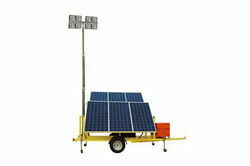 Solar light towers do not come with any fuel-related costs during operation. In the worst case scenario, workers would need to replace a faulty battery, bulb or solar panel to maintain consistent operation. “The equipment and installation represents a significant investment and maintenance also adds a further expense that must be factored in as well. Yes, these things do indeed carry a price tag, but it is their potential that reveals the true costs over the life of the operations which show us that not only is going green beneficial, but cost effective as well in the long run,” said Larson Electronics.